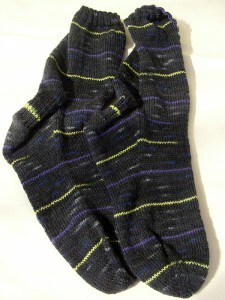 The ugly bloke socks are an FO. Just a basic plain sock in Regia sock yarn from a cheap job lot I bought from Astrid’s Dutch Obsessions. Nothing much to say about them. Let’s move on and work on something more exciting. There’s just no hope, is there? BTW – have a great day tomorrow . I was going to send cake (gingerbread) but the sad events of the weekend kind of took over. Have a virtual cake instead? Sad events indeed. I remember her as a tiny little thing when you first had her. *hugs* to you all. We had cake at the weekend and I’m sure there will be more during the week.